How did I redeem myself this week? Tom, the butcher, informed me he had chased down a Wild Hare for me. I was immediately impressed- I’ve heard those guys are fast runners, well faster than a tortoise at least. This week- no way! I had contact with Tom early to ensure this beast, well- little beast, was out of the freezer and good to go. In fact there was nearly too much contact, as it turned out we had confused things and timings were off. So when Wednesday rolled round and I eyed picking up the little sprinter, it eventuated that it had been ready to go for quite a few days already. No worries, it was still good to go and I watched intently as the cleaver did its work, almost as an extension of Tom’s arm, carving the carcass into segments for ease of cooking. 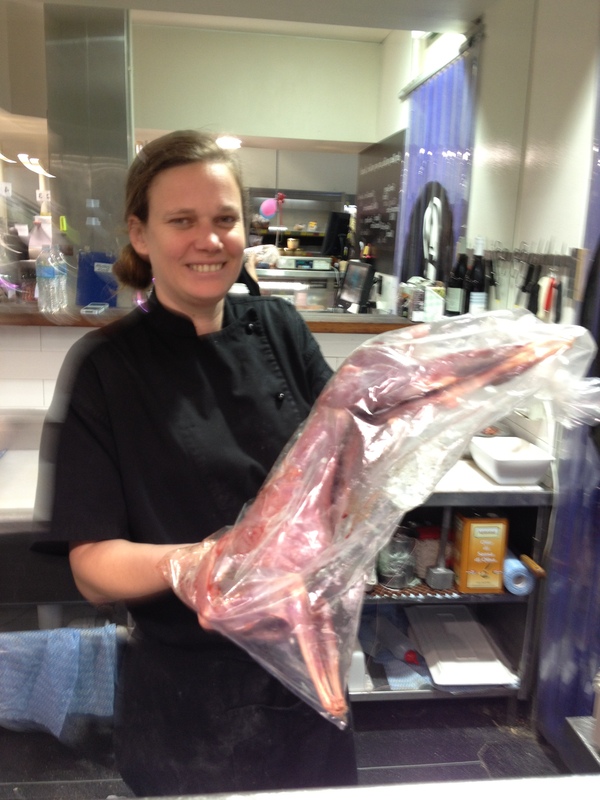 What do you do with a whole hare? This was my exact thought upon learning the size of this animal. At a touch over 2kg it packed some weight. Perhaps this is what resulted in its getting shot in the first place. A little too sluggish around the farm, not working on its infamous speed. To quote the great and iconic Kiwi film ‘Once Were Warriors’ – “Too much weights, too enough speed work, useless pr*ck”. When it comes to reputation, racing fast and hare go hand in hand. 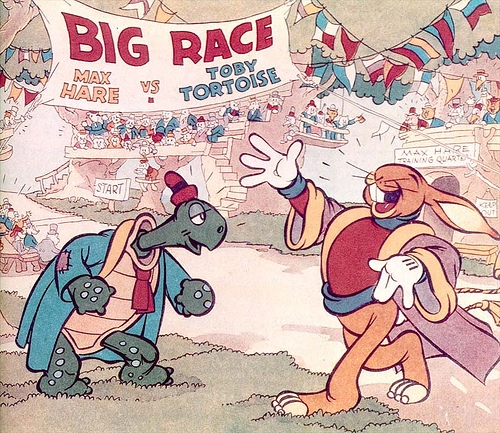 However, unless the race was to my belly, this hare did not win, because it definitely found its way there, and so far no tortoise has. I discussed a recipe with the guys at The Butcher And The Chef- Tom and Veronique- and it was settled that a French taste was the way to go. Once Tom had done the butchering, I had my recipe notes down, my shopping bag well and truly laden with wild hare, and some more French cuisine tips in my arsenal, it was off home to get cooking! This is where the tortoise came in. I rushed home, but it was only so I could get this hare cooking and give it enough time- 4 hours- to cook gently. 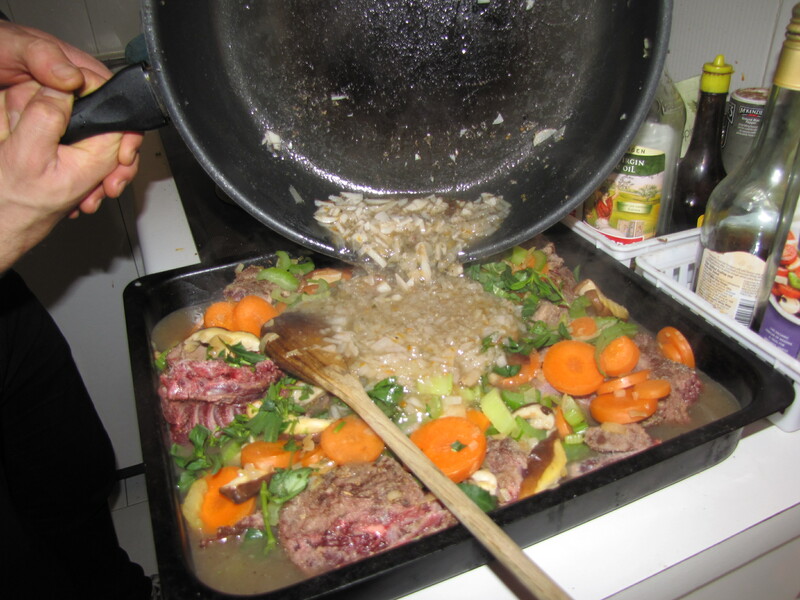 The danger with cooking wild meat is acting like the hare and moving too quickly. A more tortoise-esque approach is needed; slow cooking in low heats generally works best, allowing the meat to tenderise and the aromatic flavours to disperse. I needed patience on this one. The aromas throughout my flat were strong and stimulated the salivary glands for an extended period. NN was in attendance and we had to distract ourselves with some work to avoid any temptation to remove and eat prematurely. I checked every hour and things were on track nicely. I decided to accompany the meat with a new mash creation of golden kumara and broccoli. Once they were boiled and softened I added to the blender with a knob of butter, mixed and the murky green result was ready to go! How did the Hare turn out? I removed the meat from the oven and the dish. It smelt and looked divine. I could tell from handling it this was going to be fall from the bone tender. At this point I improvised on the sauce reduction as the liquid had nearly all gone. So, the tray hit the stove, I added some butter, white wine and cream, stirred and heated through until the alcohol burnt off. At this point the only thing left to do was serve and eat! I was confident on sitting down this was going to well and truly surpass the offal offering from the week before and many others this year. I wasn’t wrong. This hare was utterly celestial. It very much required a hands-on approach in order to handle some of the small bones, of which there were plenty, but the flesh all pulled away with ease. The flavours were immense- I could instantly recognise the gaminess of the meat, similar to the wild goat and pig I’ve cooked in recent weeks, however, it had soaked the flavours of the veggies, wine, stock and port beautifully. 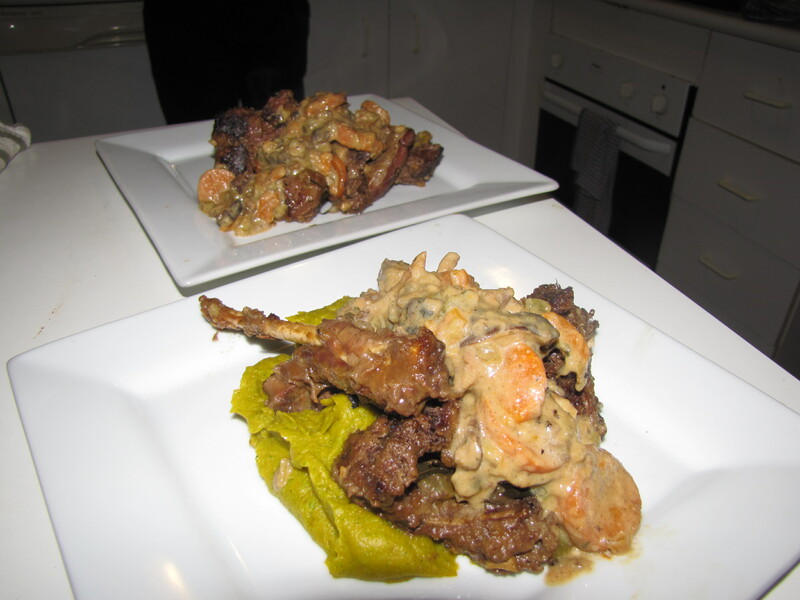 The sauce added great taste and the little mash of kumara and broccoli was super delicious. NN was left with a bitter taste in her mouth after the offal fiasco, and my meat efforts needed clawing back in her book. She set out to jinx me with early calls of “this is going to be awesome”. No pressure… However, not only did she avoid disappointment, but she was a bit “jizzy” (her word) over the hare, and only just found the balance between eating it and emitting a stream of superlatives describing it. Suffice to say she was happy, and therefore so was I. Finally the Hare was a winner! What can I take from this dish? Does a Hare sh*t in the woods?! (Let’s assume yes…)Well first off- if that review of the finished dish doesn’t sell, and shoot, a few more wild hares then I don’t know what will! Adding to the taste and satisfaction of eating it is the wonderful nutritional benefits of this wild meat. I’ve mentioned it many times before, and I started to address it last week in my 3 keys to optimal nutrition– quality counts! Wild meat is jammed packed full of amazing nutrients, just cook it like the tortoise runs the race- slowly! And with that I am back on track and happy that there is life back in my 52 meat challenge. In fact I have some of the hare left over, I think I’ll eat some now! Next week I’ll be in New Zealand being interviewed on breakfast TV about this challenge and blog. Make sure to keep an eye out for the result. I’ll be cooking some meat on the show, and if all goes well with the NZ postal service it is going to be a new and very rare one. Hard to come by that is, not still bleeding! If you’re in New Zealand then tune into TVNZ Breakfast Saturday morning around 8:30am! If you’re on twitter, then on the day please show your support for me @mcampbell2012 on the show @BreakfastonOne! And please remember to follow me on facebook and keep an eye out for my new website, launching this week! I’m Mike and this was week 27.